I posted a photo of my pink adenium not too long ago, here is another bloom for Todays Flowers, red adenium flower close up. Adenium is a genus of flowering plants in the family Apocynaceae, containing a single species, Adenium obesum, also known as Sabi Star, Kudu or Desert-rose. It is native to tropical and subtropical eastern and southern Africa and Arabia. It is an evergreen succulent shrub in tropical climates and semi-deciduous to deciduous in colder climates, is also dependent on the subspecies or cultivar. Growing to 1–3 m in height, with pachycaul stems and a stout, swollen basal caudex. The leaves are spirally arranged, clustered toward the tips of the shoots, simple entire, leathery in texture, 5–15 cm long and 1–8 cm broad. The flowers are tubular, 2–5 cm long, with the outer portion 4–6 cm diameter with five petals, resembling those of other related genera such as Plumeria and Nerium. The flowers tend to red and pink, often with a whitish blush outward of the throat. 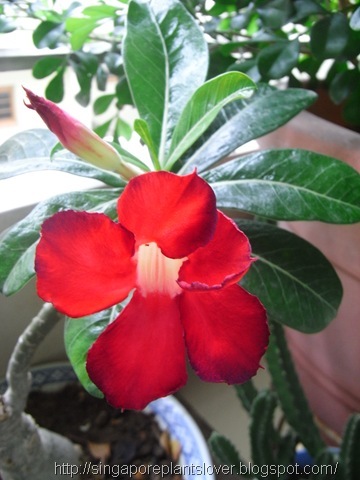 Adenium is one kind of plants which is very easy to take care of. It requires dry soil and at least two hours sunlight daily. They are fast-growing and easy to cultivate when given proper care. Adeniums also respond well to regular and generous fertilizing. I use slow-release fertilizer for my adenium plants. Adenium is one of my favorite plants. I have a few pots of Adenium, the most common one is the pink color flowers. I love this ruby red adenium flower, very bright. I hope the Ruby Tuesday readers like my red adenium flowers too. I am looking for the white flowers and yellow flower adenium now, I wish I could get one of them, has been hunting for it quite sometime. 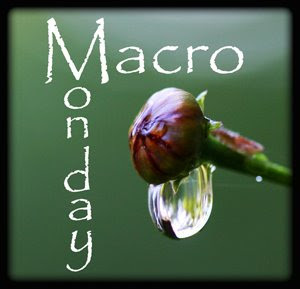 Visit Macro Monday for more fascinating macros of all kinds. Stunning Red Adenium! Thank you for sharing and I hope your weekend is wonderful! Please come visit when you have a moment! Hi Paula! Your flower of today is breath taking! Very exquisite! I've see the Adenium so commonly grown by my chinese neighbour, any special reason? I like the way the flower seems to be lit from within. Such a beautiful flower. You have been tagged for the Honest Scrap Award. See my post on my blog for more information. That is a very cool flower! I'm going to look into seeing if I can buy this plant. Thanks for sharing!